Farmers looking for low cost improvements to farm productivity should consider soil management practices that encourage earthworms to thrive. Strip tillage with the SoilWarrior® encourages worm activity without surrendering all your tillage. With a strip tillage system, the seedbed is divided into a seedling zone and a soil management zone. The seedling zone is mechanically tilled to optimize soil for germination and seedling establishment while the inter-row is left undisturbed and protected by mulch. With two different soil management zones, the SoilWarrior promotes the survival of two types of earthworms. Topsoil dwellers live in the upper 2-3 inches of the soil and thrive on partially decomposed organic matter that is already incorporated into the soil. Worms that prosper in the seedling zone eat their way through the soil, creating horizontal burrows. Subsoil dwellers live in vertical burrows that are 5-6 feet deep. These worms digest surface crop residue in the soil management zone, and their castings deliver nutrients back to the soil. 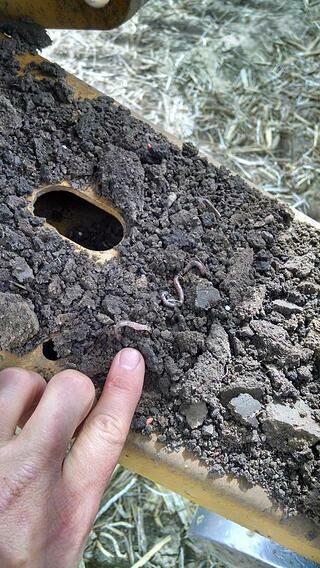 You see, earthworms and the SoilWarrior are a perfect match for soil health. The SoilWarrior builds the foundation for an ideal earthworm environment. The earthworms then go to work encouraging root growth, promoting drainage and rebuilding topsoil. So, let’s recognize earthworms as the heroes of soil health. After all, when it comes to soil management, nothing is as effective or dirt cheap as an earthworm. Download our ebook to discover the benefits of zone tillage with the SoilWarrior.